this thursday was my final day of school & it was also the last of my cooking tests. 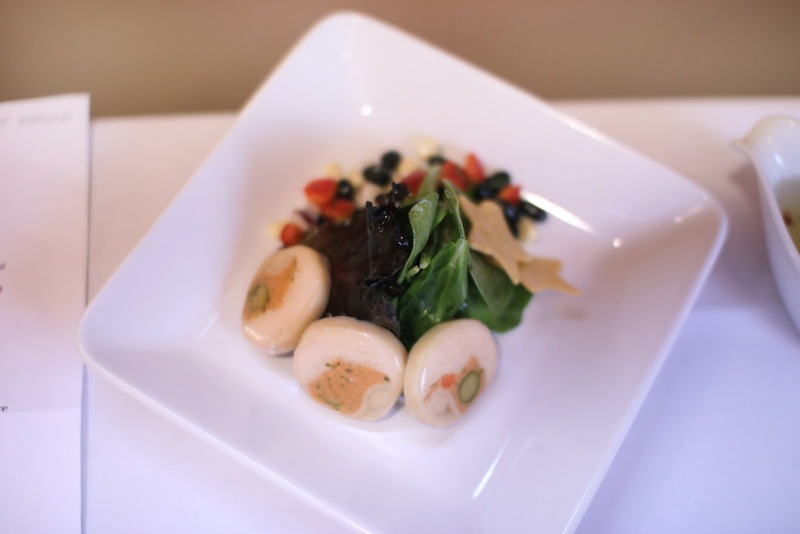 an appetizer made entirely out of aspic work, a hot entree plate, and a cold dessert plate. I'll start with my dessert- because every meal should start with dessert. 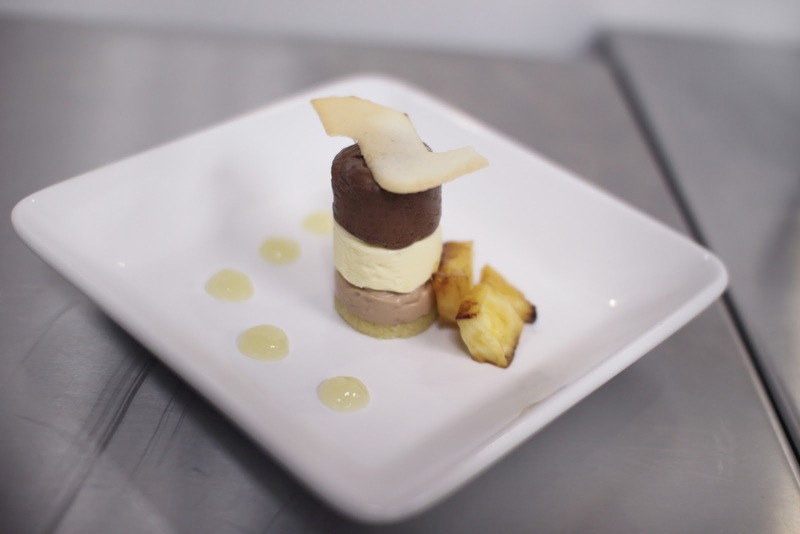 three layers of creamy chocolate bavarian, dark milk and white, served with a crispy sweet tuile, rum marinated pineapple, caramelized and finished with a pineapple rum sauce. the layers on this didn't turn out exactly how I wanted, but I scored a 28 out of 30 on this dish, and I don't regret a thing. this was definitely the most challenging of all the dishes. this food is aspic work & inedible. it is critiqued solely on presentation & as you can see, its not very pretty food to begin with. 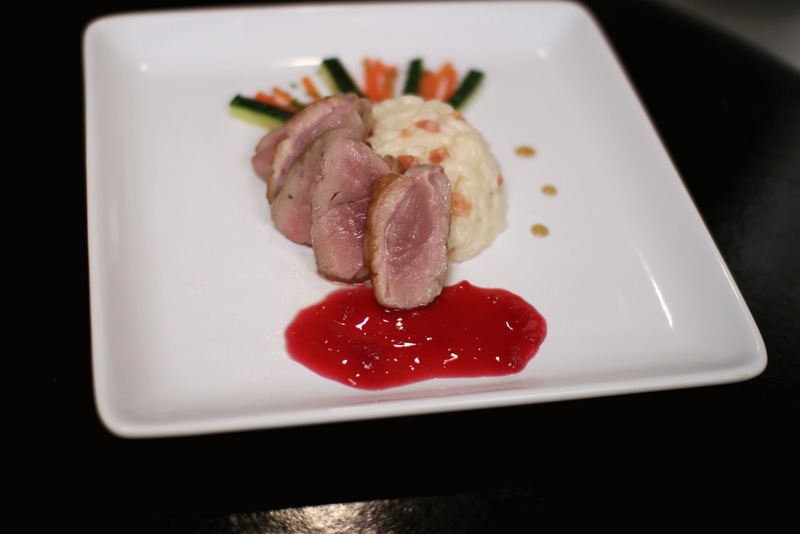 the galantine and greens and relish had to be completely shiny with no bubbles or lines. the smoothness was difficult to attain, however, I did it! (for the most part) and scored fairly well, which I am beyond pleased with. all in all I received a 97% on my practical final! that is the highest grade I have received on any practical final & I am floating with elation. because of the 97, I will also receive a gold medal for the class (which is awesome considering this teacher has never given out gold medals & this was the hardest module- especially with me missing 8 days for my honeymoon). it is the greatest feeling to end this journey with something that filled me with the confidence that I did learn quite a bit, and that I am ready to go out into the world and do what I love. I am clearly, very, very pleased. this is the end, and this is the beginning. Hiring you as my personal chef ASAP. Congrats hun! Seriously?!?! You are SO stinking amazing!